Hundreds of residents took to streets in protest against the multicrore project coming up on Bellandur wetlands. “Mall beda, Neer beku! Go back Mantri!” shouted hundreds of residents — not just the adults but also the young children — assembled beside Srjapur Road, near the biggest lake of Bengaluru, Bellandur lake. They had come from HSR Layout, Koramangala and Bellandur. When government failed to take action and justice was slow in coming, citizens decided to protest, and this was the result. At 10.30 am on March 23rd, 2014, men and women from all ages wearing caps and holding umbrellas, marched towards the Mantri project in a bid to save Bellandur lake. Even though it is the exam season, children aged 12 to 15 years, held hand-written banners and raised slogans that asked stopping the construction. The crowd included residents of all nearby apartments, members of Save Bangalore Lakes group, Save Koramangala groups, Citizen Action Forum etc. It is never easy to protest against such a big project. It was evident when barricades were placed to block the traffic heading towards Sarjapur road from Koramangala. The barricades said BWSSB construction work is going on. 30 meters from the signal, one could see the corner of the road was dug, and a JCB was placed horizontally to stop the traffic. However, when a president of Koramangala S T BED Layout Residents’ Welfare Association, Rajendra Babu argued about the need to block the entire the road, the barricades were removed and the traffic was left immediately. However, the police were seen at the site during the protest. Nearly 1500 citizens were seen almost everywhere – in the tent, on both sides of the road, and even on the divider. Nitin Seshadri, resident of Koramangala, addressed the crowd stating that, “This is just the beginning of the fight. We will have to stage many such protests until the project is called off.” Residents clapped showing their support. After thanking the police officials, the protest ended with National Anthem. BBMP Commissioner Lakshminarayan and H S Ramesh, Head of the State Environment Impact Assessment Authority were unavailable for comments. To read more stories on the issue, click here. While experts and people’s representatives are pushing for STP, residents are suggesting rainwater harvesting. 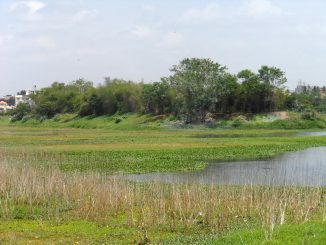 The hurry with which the project is being pushed for a rainfed lake, when there is another lake nearby which receives untreated sewage, has caused suspicion. The death of a toddler, due to the terrible condition of the roads near Hoodi circle, made the residents of Whitefield sit up and take appropriate action.